Rent this immaculate brick bungalow home in a prime location in the heart of Southampton. Just one minute walk to the sandy beach and minutes to local shopping. Relax on a spacious rear deck overlooking a private treed backyard or enjoy the view of Lake Huron's sunsets while sitting on the covered front porch. 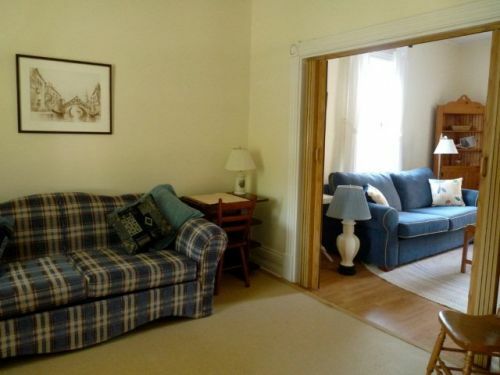 plus a double pullout sofa-bed in the private parlour. cable TV and telephone for local calls. Please bring your own linens. Pillows and duvets/comforters are provided. This is a totally pet free and smoke free home. Rental weeks run Saturday to Saturday; checkin at 3:00 p.m. and departure by 11:00 a.m.